Freethinkers Anonymous > American Graffiti. > And Now You Snow. One year when I was in college it snowed heavily. Since the University Of Evansville campus is quite small and since most professors lived within walking distance I said, “Hey, what are they gonna do, cancel classes?” They cancelled classes. I just wish they’d cancelled them sooner because I had a test the afternoon it started snowing and I ended the final essay question ended with, “Foucault’s reasoning on this matter was I can’t go on because it’s snowing and there are people playing in the snow and I’m sitting right next to the window and it’s impossible to concentrate”. Anyway we had a lot of free time with classes cancelled and some time after midnight a group of us decided we should build a snow sculpture right in front of the main door of the administration building. We had a very specific shape for this snow sculpture: it would be tall and narrow and have kind of a rounded top, sort of like a mushroom, but we also planned to put two large spheres on either side of the base. Unfortunately it turned out to be hard to get such a structure erect, if you catch my snowdrift. We briefly tried to use a trash can as a frame until we got chased off by campus security after I unsuccessfully tried to argue that we were celebrating the Japanese festival of Kanamara Matsuri early, but that’s another story. In the end I think we learned a valuable lesson even if I’m not sure what lesson that was, and so did the person who ran into the snowman pictured above. 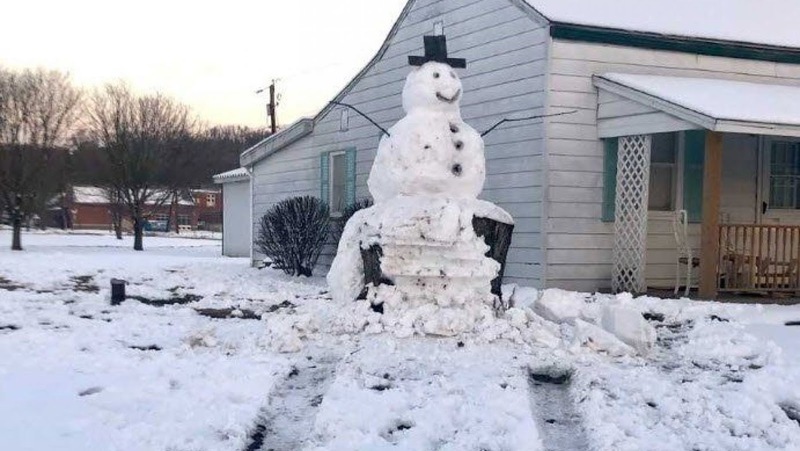 Some people decided to build a snowman in their own yard and some idiot decided to drive across their yard in a truck and run into it–not realizing that the nine-foot snowman was built around a tree trunk. There’s a valuable lesson in that and this time I know what it is, although I’m not so sure about the guy driving around with a smashed-in front to his pickup truck as a very visible display to the world that he picked a fight with a snowman and lost. I love the very specific shape of this post, Chris. I love the shape of this and all your other comments. Everything about this is hilarious, from your phallic frolicking to the tree trunk karma! The phallic frolicking was definitely a lot of fun, but I really like that the person who tried to smash a snowman got what he deserved. And while we may never know his identity we can be almost certain it’s a guy.